Who doesn’t love adorable little bunny tails? And it’s just in time for Easter! So, the Easter bunny will be coming shortly. 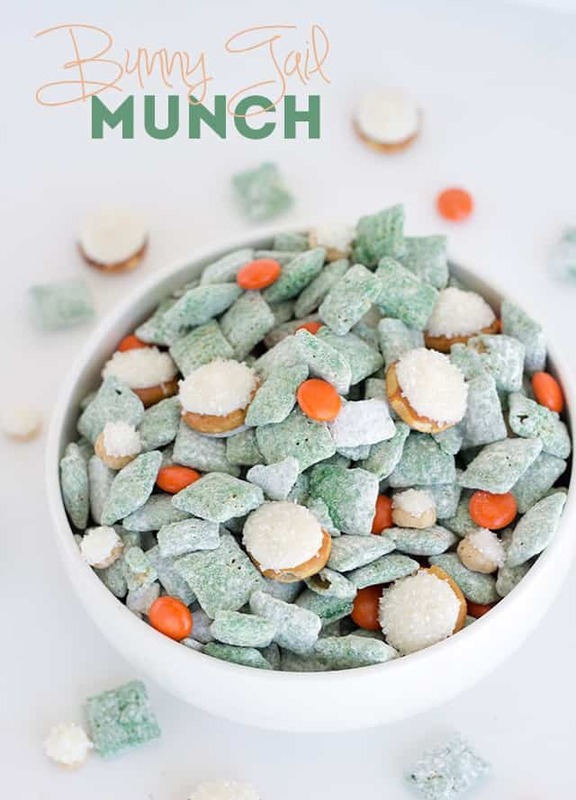 What’s better than to have some bunny tail munch on hand to get the kids pumped up for the bunny? Let me answer that for you. Nothing. Nothing is better.
. Those are what I used. 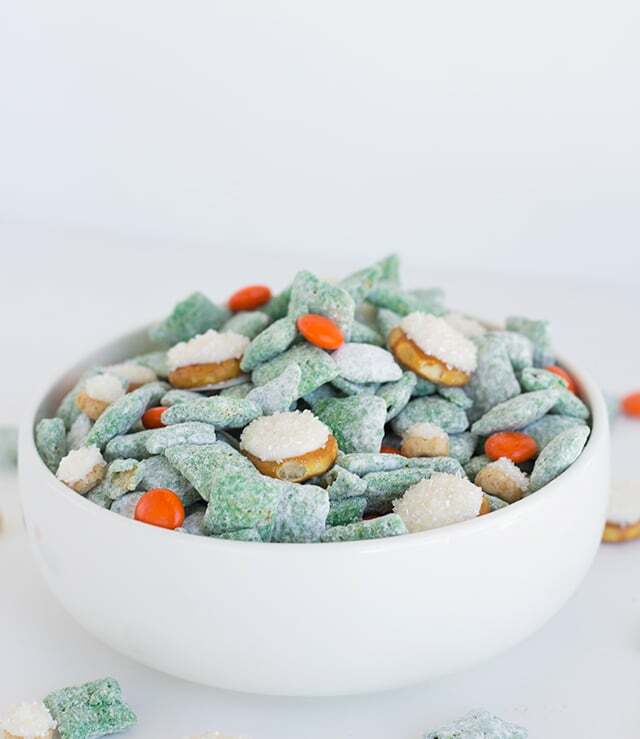 You can surely buy a bag of any candies that have little orange ones in it and pick them out, if your heart desires. The next task at hand is to get yourself some round pretzels. White chocolate or yogurt pretzels would be perfect, but I couldn’t find any. They have to be round otherwise you’ll have weird shaped bunny tails. If you’re A-okay with funny looking bunny tails though, then go for it! I even saw that they throw them in some chex mix bags. No one likes to just eat them plain anyhow, so if you cannot find plain round pretzels, grab a bag of the turtle or honey nut chex mix. They have round pretzels in them. Lay down a large piece of wax paper or parchment paper. Lay out all your round pretzels and cheerios. Make sure they're flat and not stacked. If you don't want baby bunny tails, leave out the cheerios. 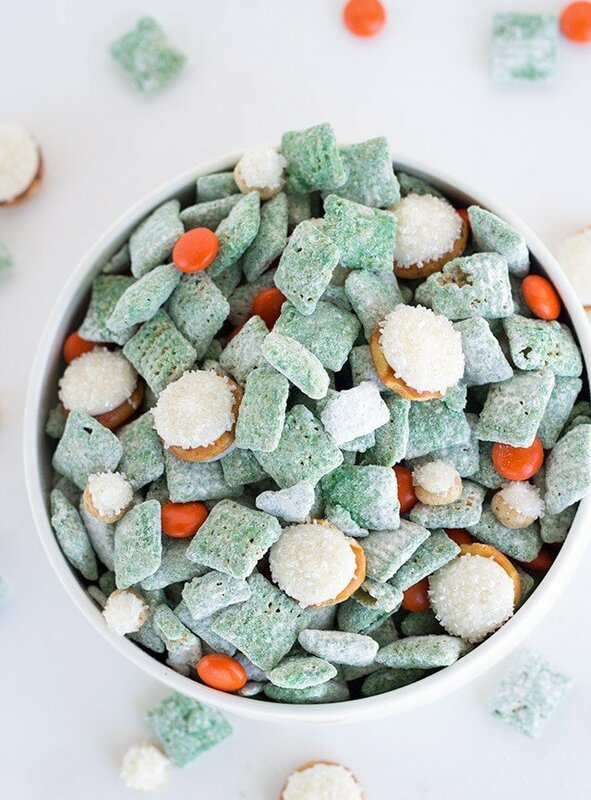 In a disposable piping bag or zip lock bag, microwave the white candy melts for 30 seconds intervals then squishing the bag around after each interval. Repeat about 3 more times to completely melt the candy melts. Cut a very small hole in the corner or tip of the bag. This will allow more control of the chocolate flowing out. Fill the hole of the pretzels and cheerios and continue to fill until there is a nice dome on top. Don't go too high otherwise the chocolate will just run over the sides. I recommend doing about 5 pretzels at a time and 8 cheerios at a time so the chocolate doesn't dry before you add the shimmer sugar. Cover the wet chocolate with tons of shimmer sugar. I had domes of shimmer sugar around my pretzels to assure they were completely covered. 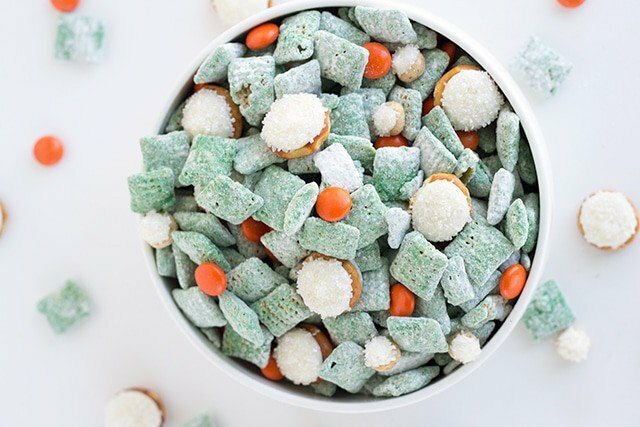 Repeat until all the pretzels are filled with white chocolate and topped with shimmer sugar. Let dry completely. It shouldn't take too long, but I waited about 45 minutes before moving mine to assure they were completely dry. In a large bowl, add in the toasted corn cereal. 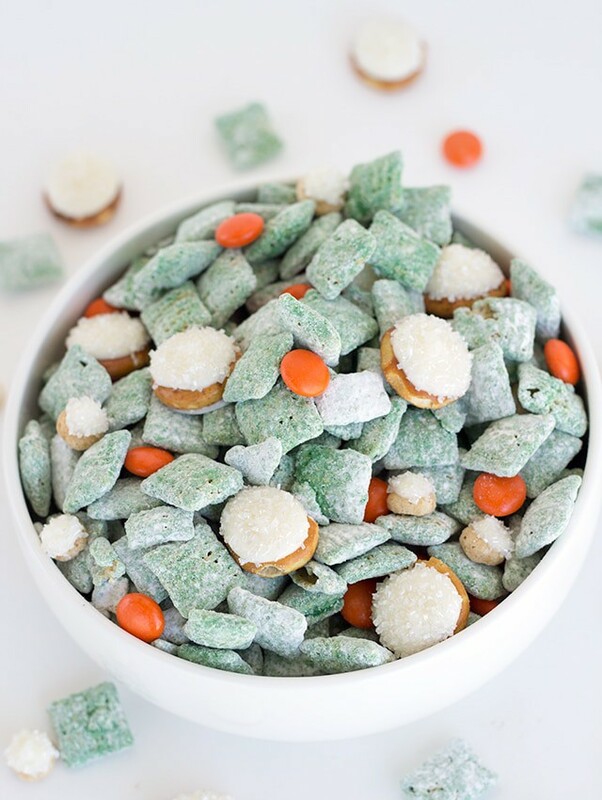 In a microwave-safe bowl, add in the green candy melts. Microwave for 30 seconds and then stir. Microwave the candy melts and stir after each time being microwave three more times. The chocolate should be completely smooth and melted. Add the melted candy melts in with the toasted corn cereal. 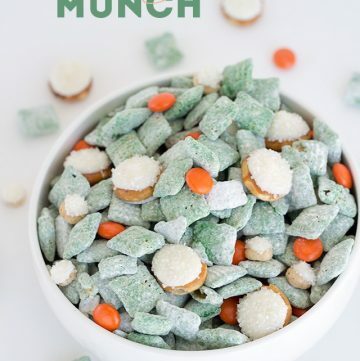 Stir until all of the cereal is completely covered with the green candy melts. Add in the powdered sugar and stir until all the cereal is coated with the powdered sugar. Place the munch into a clean serving bowl. Add the dried bunny tails and Reese's pieces. Give it a quick stir and serve. This is another sweet and salty snack. I can’t help it, guys. 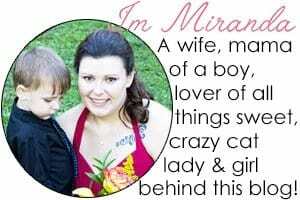 It’s my thing.